I just found your videos today. I am starting doing yoga for my health and well being. I have fibromyalgia and have not been very active the last 2 years b/c of it. I realized recently that the only way I will feel better is to move more. I have made a commitment to myself to do so. I notice that most your videos are about an hour long. Do you have any that are closer to 30 minutes and that would be good for a beginner with fibromyalgia? I did look over the beginner video and I do believe that I will give it a try. Just wanting to see if there is anything specific you might recommend. And I must say, thank you so much for your informative, lengthy, detailed free videos, its a great help. I do actually have a video that I created for fibromyalgia. The video is divided into 3 sections, so that you could do 3 twenty minute classes or one sixty minute class depending on how you are feeling that day. The first part is a long guided relaxation with focus on breathing and tension release through your whole body. The second part is completely lying down, the third part is done from a chair. 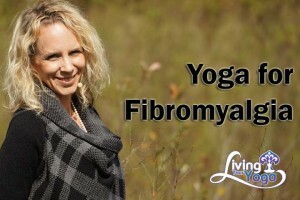 The stretches offered in this class focus particularly on the painful zones that I surveyed in my students who suffer from fibromyalgia, specifically: tight hamstrings from muscle spasms, lower back, neck and shoulders. Alternatively you could focus on a beginner class like Namaste Yoga 129 from the Beginner Series which focuses on Preparatory Poses and divide the class into two 30 minute chunks.